Angels and Demons by Dan Brown was written in 2000 and adapted into a movie in 2009 starring Tom Hanks as Robert Langdon. 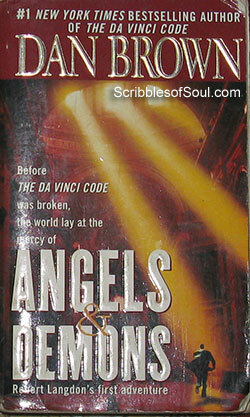 I had seen the movie and believed that ‘Angels and Demons’ was written after ‘Da Vinci Code‘ as a sequel but only after reading Angels and Demons, I realized that it was the first book in the series introducing Robert Langdon, a Sauvé Harward Professor and accomplished religious symbologist, and the main protagonist of Dan Brown’s novels. The novel begins with the murder of a highly talented scientist, Leonardo Vetra, who is brutally killed in his own quarter in CERN, branded with a strange symbol and his one eye is gouged out of the socket by the killer, The CERN Director, Maximilin Kohler instead of calling authorities, searches on the internet and invites Robert Langdon to solve the murder mystery. When Langdon reaches the CERN HQ, he is astonished to see that the name branded on the chest of murdered scientist is a perfect ambigram of Illuminati, a symbol of the secret brotherhood. The Illuminati was an ancient society of the enlightened men, who had a tiff with the Church, since their scientific thoughts often clashed with the rudimentary and orthodox beliefs of the religion. However, Robert, being an anxious symbologist knows that there is no concrete proof of brotherhood being still active and if it could stoop to such low levels as to murder the new age enlightened men- the scientists. Vittoria Vetra, the adopted daughter of Leonardo informs Kohler and Langdon that his late father had successfully replicated the genesis theory in his lab and in the process, created anti-matter, which can be used as a deadly weapon by wrong people, and a large sample of anti matter is missing from the lab. Kohler gets a phone call from Vatican Church, regarding the video transmission showing presence of a strange looking canister, in some unknown area of the church. Kohler, Langdon and Vittoria suspect that the canister contains anti matter, Due to a sudden asthmatic attack, Kohler could not accompany them to Vatican City and Robert and Vittoria leave immediately to protect the God’s City from an imminent terror attack. At Vatican City, they come to know that the Pope had died fifteen days ago and a Conclave was being held today to elect new pope. But, four cardinals who were the Preferiti, the favored candidates were missing. A man calls the Camerlengo and threatens to kill the cardinals one by one starting from 7:00 p.m. and warns that the ghastly murders will culminate with the entire Vatican City being exploded at midnight. Langdon has to find out where the murders will be carried out so that the assassin can be captured and the exact location of anti matter be discovered, before it gets too late. Then starts the real fun of the novel, lots of twists and turns, to discover the lost Path of Illumination, decoding the symbols and clues left by earlier Illuminati members such as Galilieo and Bernini, and that too, to be accomplished within the fast running, tight schedule of time, as the murder take place with perfect precision at the appointed hour. Angels and Demons, despite a slow start, becomes interesting after first 80-90 pages. The ambigrams used by Dan brown are an absolute visual delight. Every time, a new symbol appeared, I was tempted to reverse the book and marvel at the sheer genius of the artist, who created such symmetrical, yet baffling symbols for the book. The narrative, however, tends to drag, at times, with lots of digressing thoughts of the characters, making it exhausting, and unnecessarily prolonging the suspense. Dan Brown definitely improved by leaps and bounds in his next novel ‘Da Vinci Code’, wherein he utilized the anagrams and riddles and I felt much more involved in solving the murder mystery. The fact, that I had already seen the movie, and was aware of the real villain, also acted as a mild dampener. But, all in all, I enjoyed Angels and Demons, though it could have been shortened and presented in a more concise manner, enhancing the thrill of this murder mystery, covering a lifetime of events in under twenty four hours.